You are playing in Campaign Mode. 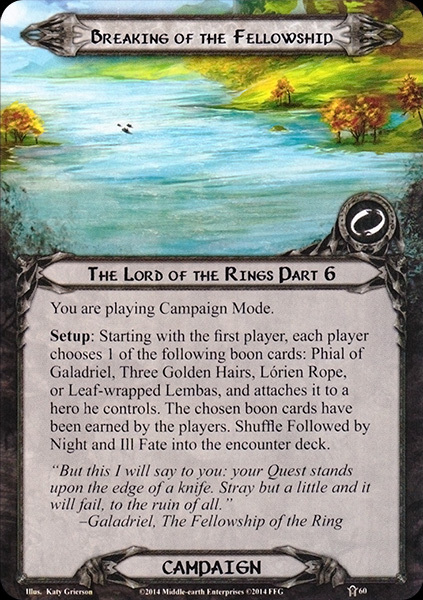 Setup: Starting with the first player, each player chooses 1 of the following boon cards: Phial of Galadriel, Three Golden Hairs, Lórien Rope, or Leaf-wrapped Lembas, and attaches it to a hero he controls. 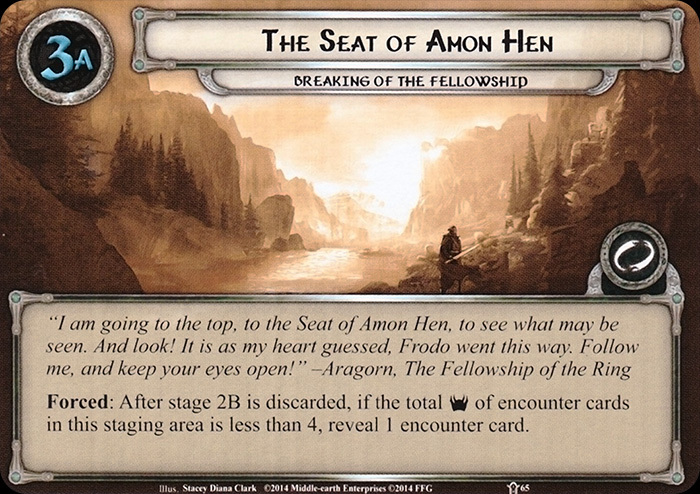 The chosen boon cards have been earned by the players. Shuffle Followed by Night and Ill Fate into the encounter deck. 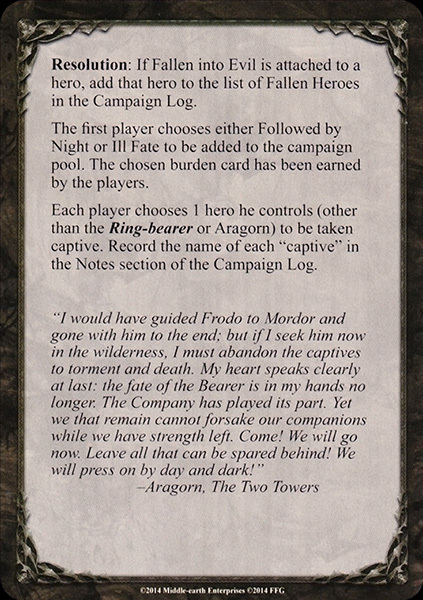 Resolution: If Fallen into Evil is attached to a hero, add that hero to the list of Fallen Heroes in the Campaign Log. The first player chooses either Followed by Night or Ill Fate to be added to the campaign pool. 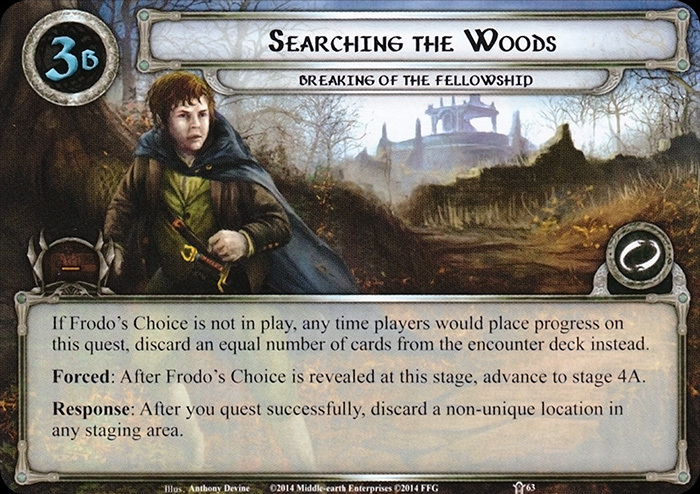 The chosen burden card has been earned by the players. 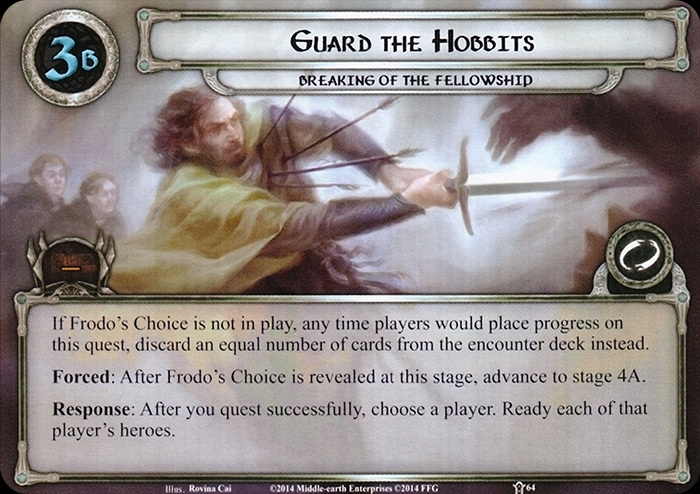 Each player chooses 1 hero he controls (other than the Ring-bearer or Aragorn) to be taken captive. 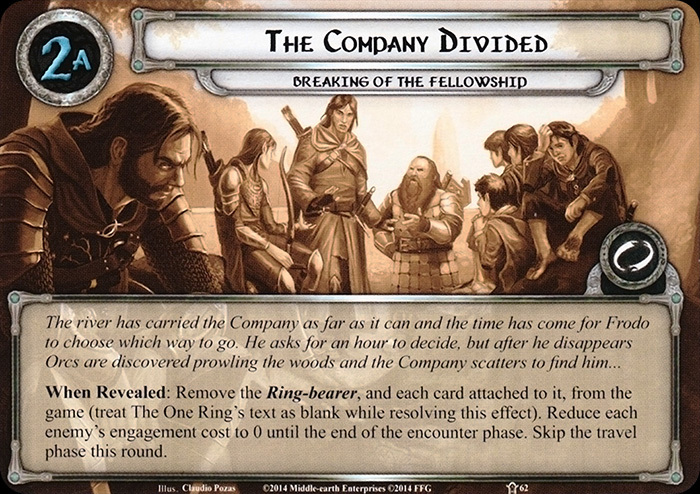 Record the name of each "captive" in the Notes section of the Campaign Log. 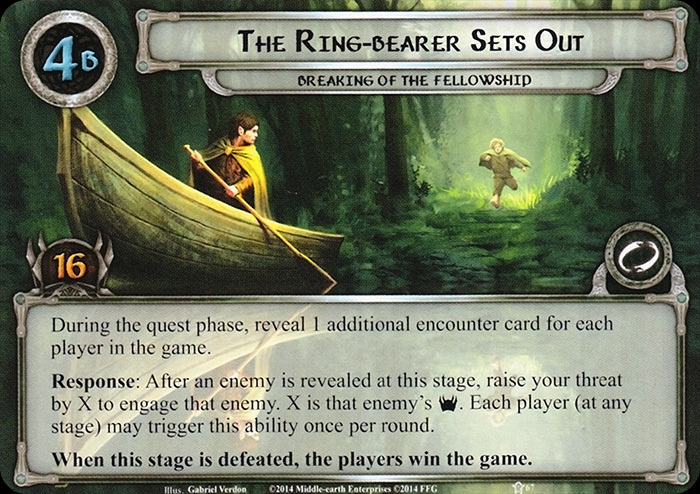 When Revealed: Remove the Ring-bearer, and each card attached to it, from the game (treat The One Ring's text as blank while resolving this effect). Reduce each enemy's engagement cost to 0 until the end of the encounter phase. Skip the travel phase this round. 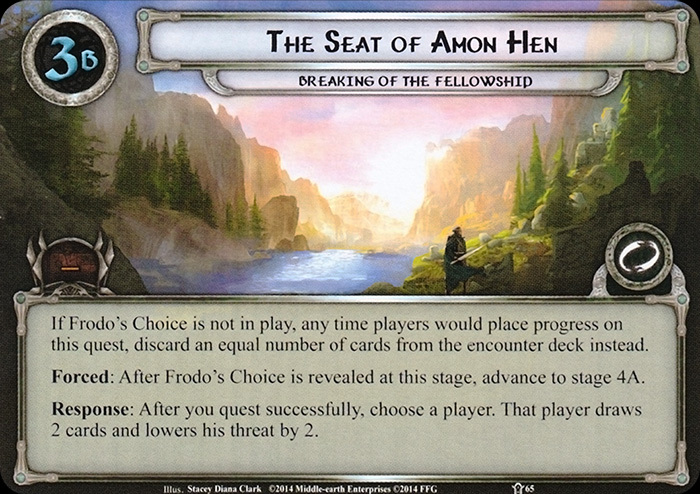 Forced: At the end of the refresh phase, shuffle Seat of Seeing and Forod's Choice into the encounter discard pile. 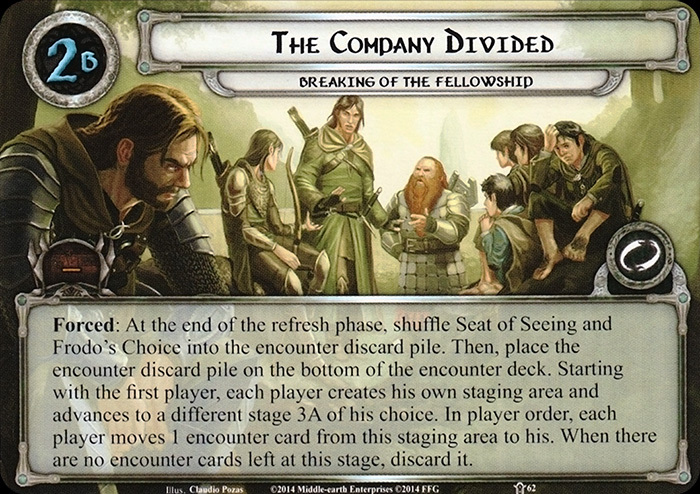 Then, place the encounter discard pile on the bottom of the encounter deck. Starting with the first player, each player creates his own staging area and advances to a different stage 3A of his choice. 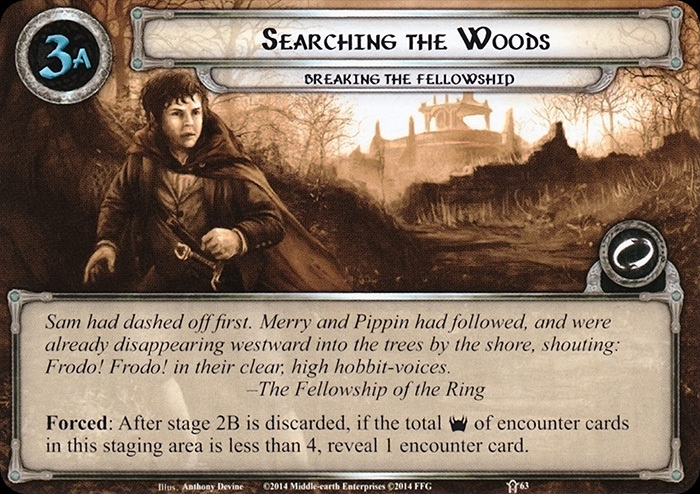 In player order, each player moves 1 encounter card from this staging area to his. When there are no encounter cards left at this stage, discard it. 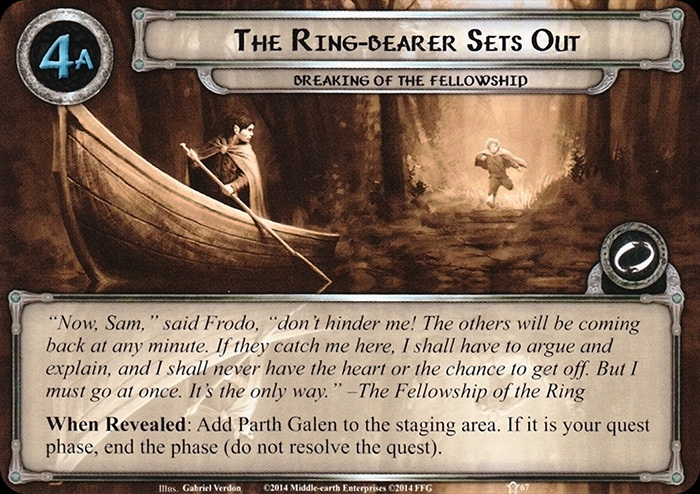 When Revealed: Add Parth Galen to the staging area. If it is your quest phase, end the phase (do not resolve the quest). 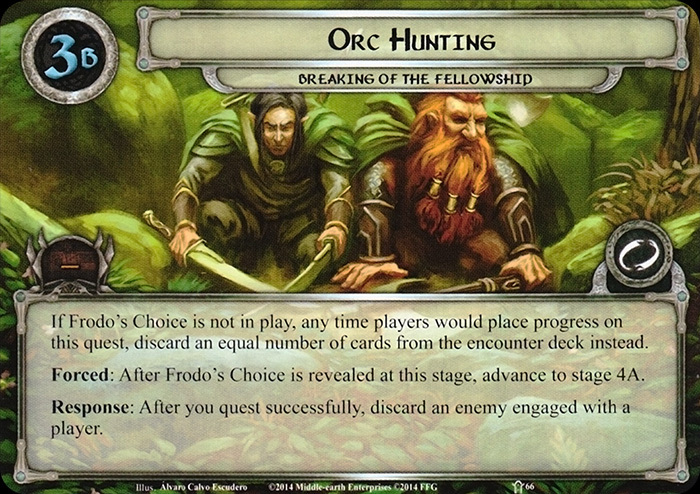 During the quest phase, reveal 1 additional encounter card for each player in the game. Response: After an enemy is revealed at this stage, raise your threat by X to engage that enemy. X is that enemy's Threat. Each player (at any stage) may trigger this ability once per round. When this stage is defeated, the players win the game. Peril. Toughness 1. Archery X.
X is the number of players at this stage. When Revealed: Discard an ally you control. Surge. Toughness 1. Archery 1. 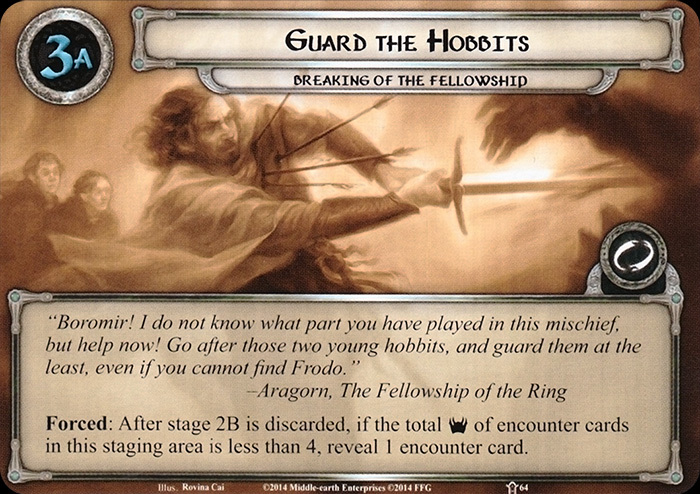 Uruk-hai Tracker gets +2 Attack against characters with 2 or fewer printed hit points. Immune to player card effects. Forced: When Sarn Gebir is explored, deal 1 damage to each exhausted character. 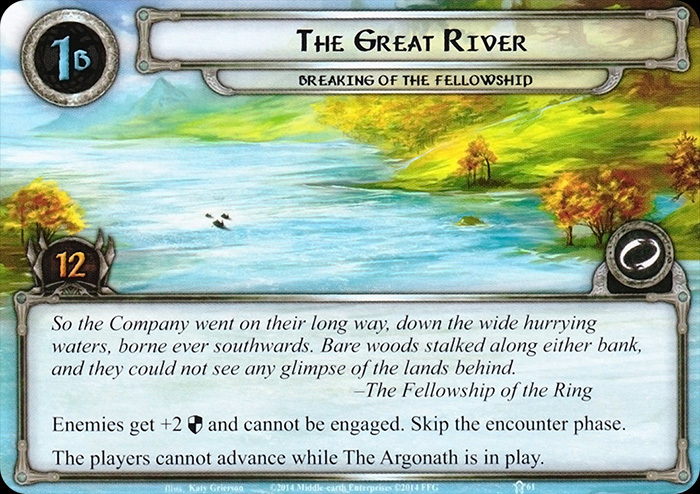 While River Anduin is in the staging area it gains: "Forced: At the end of the travel phase, each player at this stage raises his threat by 1. 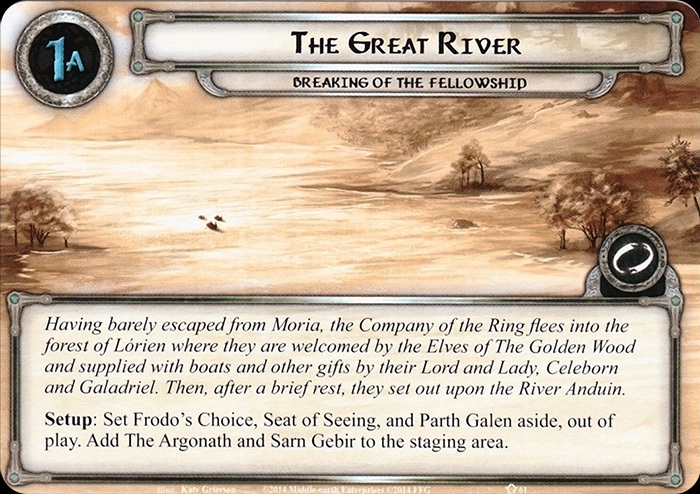 Then, River Anduin moves to the staging area to the left, if able." When Revealed: Either move 1 enemy engaged with you to the first player's staging area, or Growing Threat gains doomed 2 and surge. 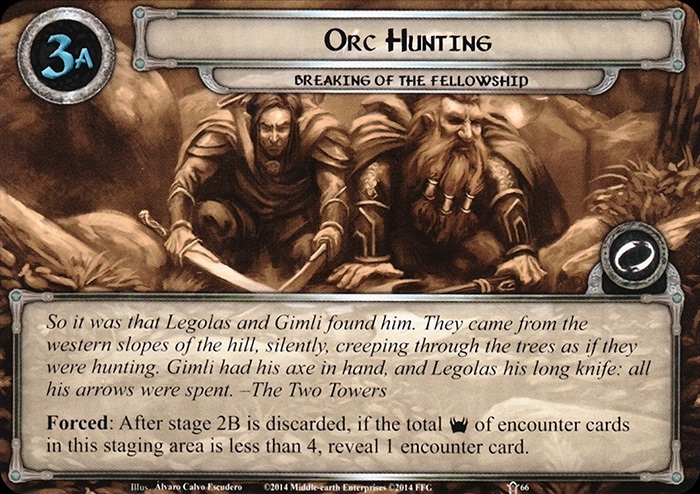 Shadow: After this attack, move attacking enemy to the first player's staging area. When Revealed: Remove all damage from each enemy at this stage. Each enemy at this stage gets +1 Threat, +1 Attack, and +1 Defense until the end of the round. Shadow: If the defending character has fewer printed hit points than the attacking enemy, this attack is considered undefended. When Revealed: Until the end of the round, add 1 to the archery total at this stage for each ally currently at this stage. When Revealed: Put the topmost enemy of the encounter deck discard pile into play engaged with you.